I said in my farewell to the blogging life two weeks ago that I would continue to write the "Who Goes There?" column for Eater. Well, I meant what I said, and a said what I meant. And I'll post links to the column here every fortnight, as the columns go up. 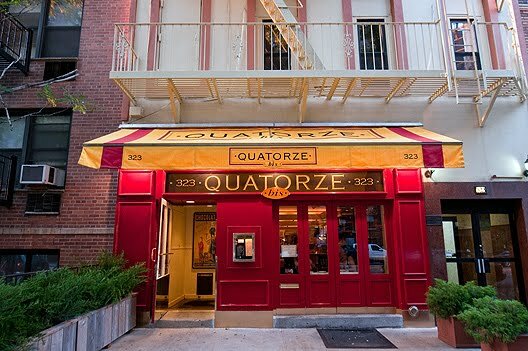 I went to the well-heeled French bistro Quatorze Bis this week. Unfortunately, it kinda reminded me of a lot of the reasons I shut Lost City down. Here's the link. Labels: upper east side, who goes there? Previously this week, I posted an item about a Corcoran sign tied to the outside gate of P.S. 29 in Cobble Hill. My reaction to the sign was heated and, I now see, too quick. I have since been told that the agent listed on the sign, Lucy Perry, knew nothing of its placement; that the sign was put there in error; and that it was there for only a few hours. I hereby apologize for any discomfort I caused Lucy and for creating an unnecessary brouhaha. I only just devoted a "Who Goes There?" column to it in April. And now Von Westernhagen is maybe for the drop. Queens Crap, who was tipped off by a read who talked to the bartender, sent me the news that the restaurant had been sold. 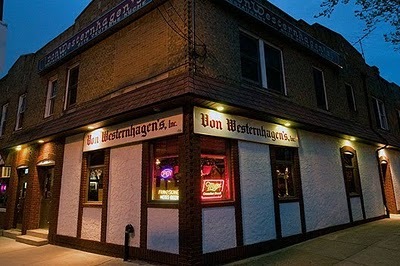 It is unclear if this marks the end for the German eatery, or if the new owners will continue the tradition. There is apparently some kind of party on June 19. Cursed be me that I live in New York during the era in which its soul is willfully dismantled. Lost City's looking for the exit. These images are painted on the side wall of Crown Chemists in Astoria. Have no idea how long they're been there. All painted by an artist named "Berch." The St. James Convent is on Oliver Street in Chinatown. 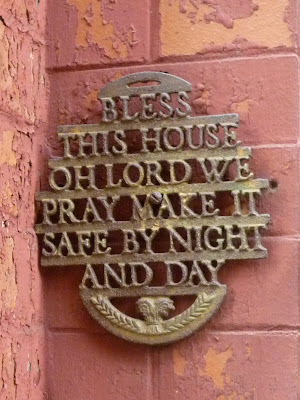 It has an interesting metal sign next to the doorbell. Makes you think twice before ringing, doesn't it? A tour bus parked outside "21." Has it come to that? Earlier reports about the late, lamented Gino said the incoming Sprinkles cupcake chain would retain the special zebra wallpaper. No so. Eater reports that the crazy decor will leave with chef-owner Michael Miele, perhaps to adorn his planned new space. This is in Gutter, a trendy bar-bowling alley in Williamsburg. 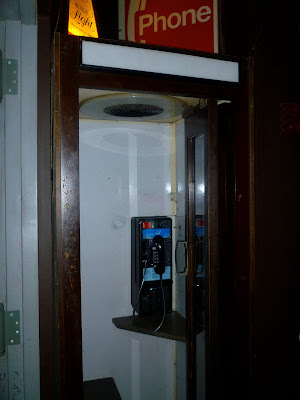 But it's still a wooden phone booth and it works. So I don't care. If face, as old places fall or have their old phone booths ripped out, new places with an affection for the old may be our only hope. You have to sort of wonder how the scrappy SoHo flea market lasted this long in a hostile environment. 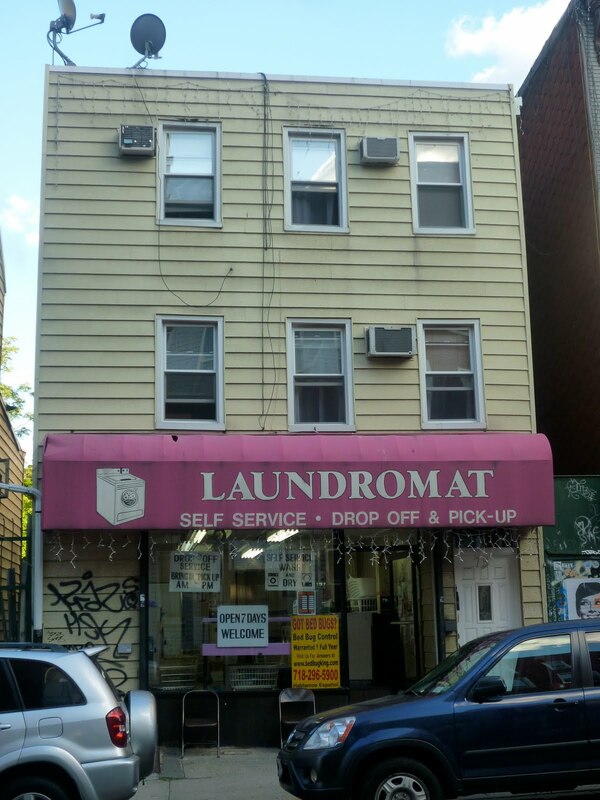 A remnant of the nabe's artistic, scruffy past, it's now finally headed for the gallows. Curbed points out "there's a fresh real estate listing out there for the lot at Spring and Wooster." Gosh. I hope they put up a glassy condo or something. Meanwhile, the Greenpoint Food Market, which everyone loves, and the Times said was wonderful, needs to be shut down, the DOH decided. Well, of course it does! Who wants a wholesome gathering of locally made, delicious foodstuffs? Not me. I want all those happy creative cooks to go through official channels until their expenses skyrockets and they can pass the cost on to me! Lost City's getting tired. 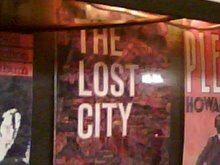 Lost City's city is lost. 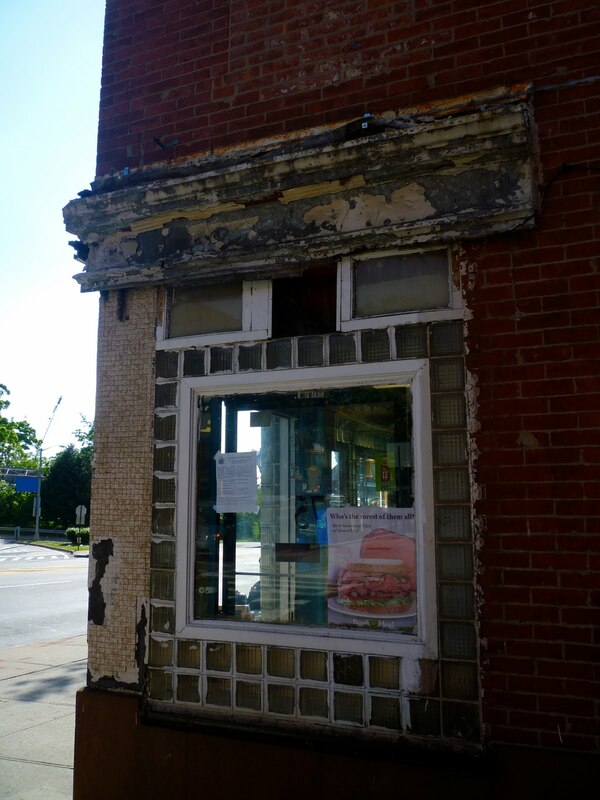 The deli at the northwest corner of Hicks and Altantic gets the prize for the working storefront in need of a little work. I'm guessing they're in the middle of a reno. Still, it's been like this for weeks. Kinda cool, in a way. I mean look at that weathered cornice. I love that a Wine & Liquors sign still hangs over a bike shop on Havemeyer Street in Williamsburg. Some months ago I switched from the heinous Chase to Citibank for my banking. Not that I thought Citibank a less evil entity than Chase (though I did think that to be the case, ever so slightly, at the time), but because the Court Street Citibank branch was managed by a nice man who had done my wife some very good turns. This manager, tall, affable and bespectacled, was unlike any I had ever encountered at a large bank. He knew he was just a cog in a huge, heartless machine, but he nonetheless tried to make a difference. He reached out to local businesses, encouraging them to bank with him, explaining that even though it was Citibank, he intended to operate his branch like a local bank. He was openly and candidly critical of some of Citibank's policies in regard to its depositors, and critical of the banking industry in general. He was particularly caustic and funny when it came to Chase. When I once explained to him some twisted policy Chase had applied to my account, which had robbed me of hundreds of dollars in fees, he threw up his hands in frustration and said, "And these people rule the world!" I write a lot about old signs on this blog, and awnings that often replace them. Usually I praise the former, and curse the latter. I am Bill Smith and I contact to know if you deal in Awnings. I would like you to get me a quote base on the specifications below. Dimensions: 2) patio awnings covered plus 12" - 18". I am donating the patio awnings to NEW HOPE PRESBYTERIAN CHURCH. What would be the total cost of 100 units patio awnings, plus tax. Advice the method of payment. Hope to hear from you soon. Have a nice day. My name is Mr. Bruce McElroy, Bruce And Sons Inc, and am sending you this email regards in ordering some ATM Signs from your store, please if you do have them in stock, I will be very glad for you to get me their prices of each item. And also I will like you to get back to me if you do accept credit card for this order transactions if yes let me know so that I can advice on how to proceed now. Stay Blessed. Maybe I should go into the awning and sign business. Ain't no money in blogging. Or journalism. Or anything I do. I've been walking around Williamsburg, Brooklyn, for more than two decades. It's altered a lot in those years, I don't need to tell anyone. But as long as I've known it, this laundromat on Berry Street has stood. It's look hasn't changed much over the year. It's sort of your archetypal so-ugly-its-cool Williamsburg business. 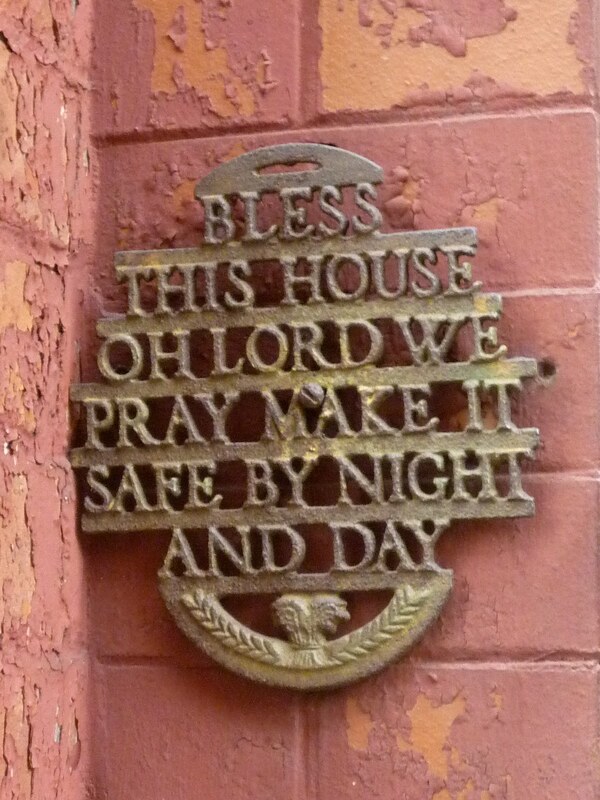 Not sure why, but I always look for it as a sort of assurance that not everything in the old neighborhood has been swept away with the gentrifying times. Last week, there was a localized brouhaha when Ultimate Burgers & Dogs, a restaurant on Degraw Street in Cobble Hill, took down an old, longstanding and beloved grocery sign from their storefront. Their claim was that the old sign confused patrons. To which claim I noisily clear my throat. Now they've started putting up a new sign, which does not improve the situation in the least. Not terrible, but nowhere near as charming. I suppose the word "Ultimate" is going in the middle. I still want to know if they broke the law by altering the facade of a landmarked buidling. 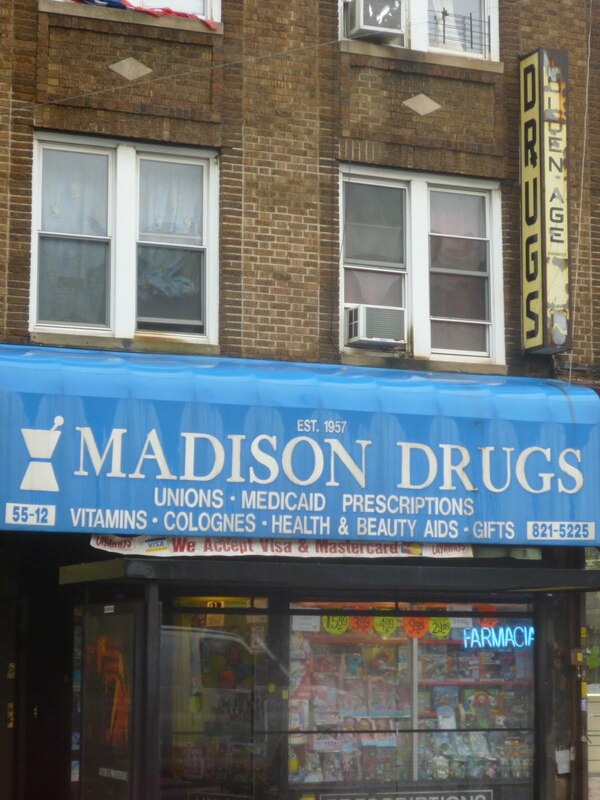 Madison Drugs in Ridgewood says it was established in 1957, though it looks rather less old than that. Do we believe them? 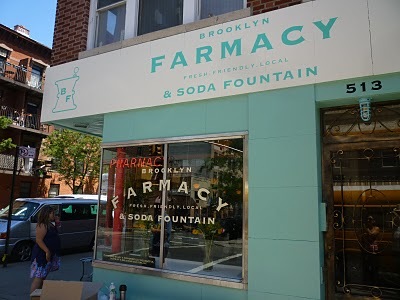 After a pause of a month since their Carroll Gardens space was transformed from an genuine old time pharmacy into a faux old-time "farmacy" and soda foundation by Discovery Channel "Construction Intervention" reality series, The Brooklyn Farmacy and Soda Fountain is finally open for business. 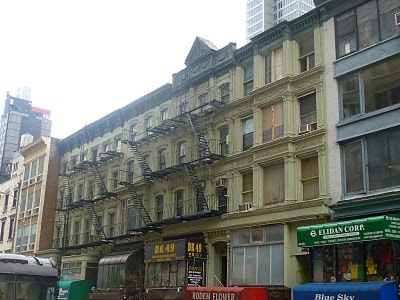 The lawyers representing the landlord Jo-Fra Properties which own building 55-49 west 28th street are trying to block the Tin Pan Alley Art Show. The lawyers went into court today 6/4/2010 to file an order blocking us from showing our artwork in our homes. The art show, FYI, is by invitation only. The ugliest people always seem to own the most beautiful buildings. Jo-Fra were the same wonders who tried to sell the lot a couple years back, with the idea of demolishing the historic street and putting up a highrise. They were also found by a judge, in 2009, to have been illegally overcharging their tenants. Of course, nobody knows who Jo-Fra is, or where they do business. One never does with these shady landlords. A part of it, anyway. A very dense, sectionalized, kid-oriented part. Swing Valley (lots of swings), Slide Mountain (lots of slides) and a water park or sorts. Reminds me of a theme park, like Six Flags. Actually, reminds me exactly of Six Flags, as I recall it as a teenager. But it's hard to knock the place, since the kids obviously love it so. An instant hit with the parental set. "This is brilliant," said a Brit mom. I've been asked that question so many times that I know what to expect: a flood of memories, a brief pause while I mentally sort through decades of only-in-New-York experiences to decide which to share, and the realization that there's no way to communicate in a few words what my childhood was like in such an amazing city. So now I keep things simple and say, "It was really...something" when asked about my Manhattan childhood. The details - complex, bigger-than-life and at times hard to believe, I keep to myself. 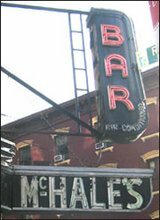 Scratch one more of the few affordable old bars left in Times Square. The Rum House, long embedded inside the Edison Hotel, on W. 47th Street, will close by the end of the years. They lost their lease. 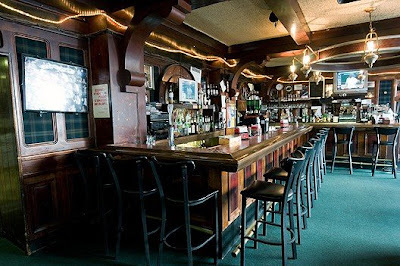 NOTE: A reader of Lost City is looking for a copy of the menu at the late, lamented Gino. Anyone out there have any connections? 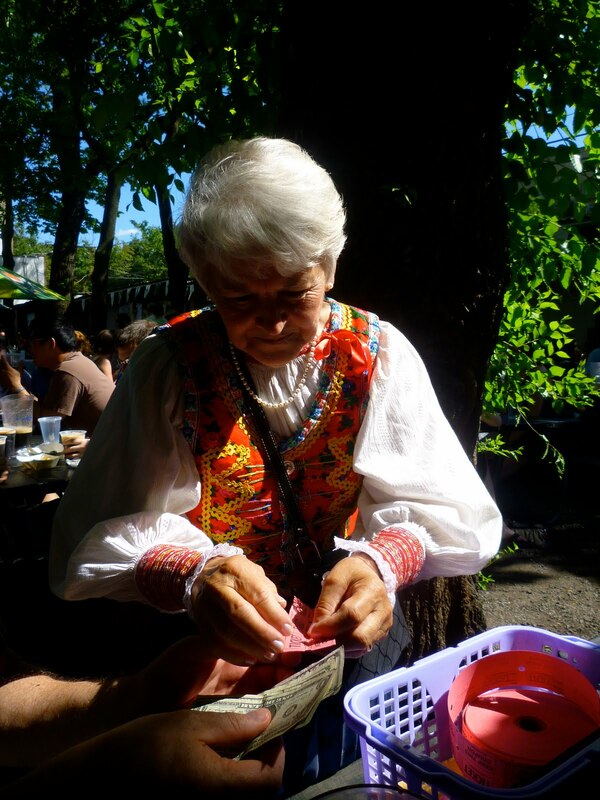 The Czech-Slovak Festival was held at Astoria's Bohemian Hall & Beer Garden this past weekend. There was a full music schedule and a raffle. First prize: round trip to Prague. The classic garden is 100 years old this year, by the way. Aren't many left like it. Go and patronize! 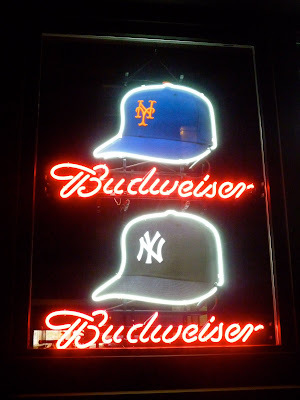 This is a gorgeous neon sign about the 30 E. 29th Street in Manhattan. It's the home of Campanile, an Italian restaurant. But Campanile opened in 1997. And that sign look far, far older than that. Therein lies a mystery. 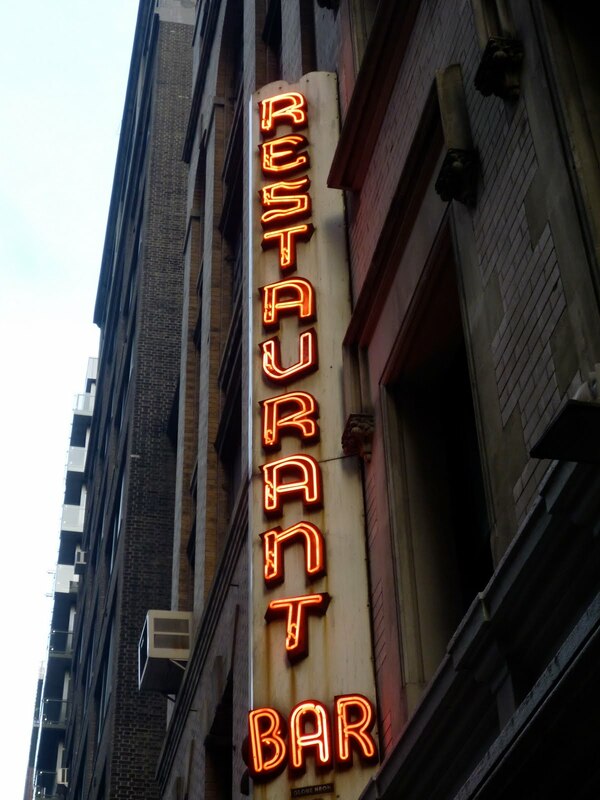 The sign must have belonged to an earlier restaurant at the same address. But I can find no records of other restaurants at this address, other than DOB documents, which indicate that a restaurant was here as far back at 1952. Does anyone out there with a long memory of this street have any info they can share? Of all the boneheaded moves. Ultimate Burgers and Dogs has taken the old "Grocery & Deli" sign down from its Degraw Street storefront in Cobble Hill because it felt the signage was confusing folks. Reports Eater: "A call confirms: a worker there say some people in the neighborhood have complained because the sign has been there for over 20 years. 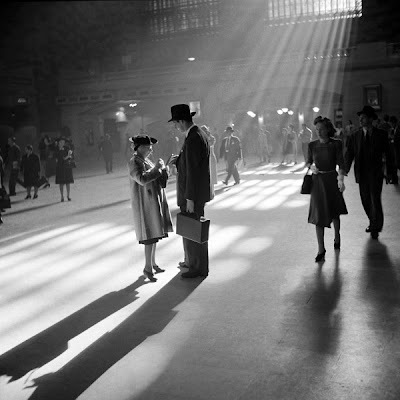 But too many people came in wanting smokes and lighters." 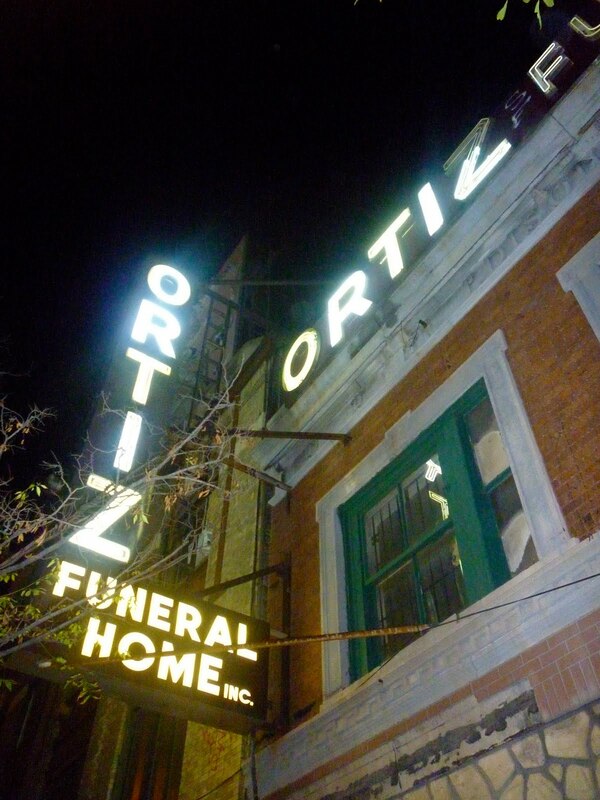 I do not think I exaggerate when I say that bit of old signage was beloved in Carroll Gardens and Cobble Hill. 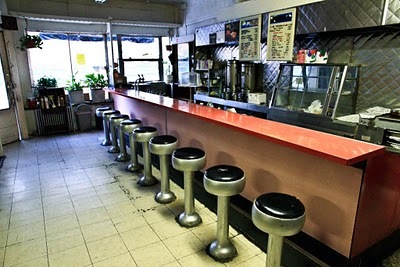 It's been there for decades, ever since the small space actually was a grocery and deli. Italian grocery and deli. Call Louis', I believe. It was still there when I moved to the area in 1994. When the deli decamped, the old sign stayed, with its great retro Coca-Cola logos. It stayed through several new businesses, mainly restaurants: Whim, Chicory, etc. They all appreciated the sign. And the neighborhood appreciated them appreciating the sign. I like Ultimate Burgers & Dogs. The owner's a good guy. He make great burgers, great dogs. But I don't believe him when he says people still come in the space looking but a pack of butts. Everyone in the area knows it hasn't been a deli for years. And how many strangers walk down that stretch of Degraw looking for cigarettes? He may be imagining that the sign is losing him business. But if business is slow, it's because that block has always been a challenge. There's not much traffic. It's out of the way and no other stores are near that store. Just put the sign back. If you need to put out a big old banner saying "Ultimate Burgers and Dogs," do it. But keep the sign. You've inadvertently de-charmed your restaurant. Also, there is this: That building is part of the Cobble Hill Historic District. Did they have permission from the Landmarks Commission to take down the sign and alter the building's facade. Hello? This building that houses the Pawn shop is odd as it had the cheap hotel in it. Also funny that your image of the pawnbrokers sign is it self broken. In any event, I have had a Post Office Box at the Madison Square P.O. on that block for 40 years, I look into that pawn shop every time I pass by and have never ever—1. Have never seen a customer in there. 2. Have not seen anything in the window change in 15 years like the cheap Bongos and yes cassette player radio and other things no one in their right mind would wish for. On Third Avenue. So, no one's offended, right? Both teams are Bud-worthy. Saw this old pawn shop among the bars and restaurants along Third Avenue in the 20s and 30s. A relic. Used to be tons of them on this strip. Wonder if this is one of the pawn shops that Ray Milland stumbled past in "The Lost Weekend." Looks likes the inspectors that spelunked through the infamous, sealed-up Rat-Squirrel House in Cobble Hill came back with a slightly hopeful report as to the derelict landmark's potential rebirth. Why do I assume this? 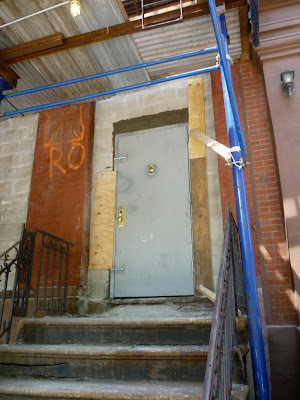 Because everyone's favorite urban disaster now has a new door! You can walk in. You can walk out. 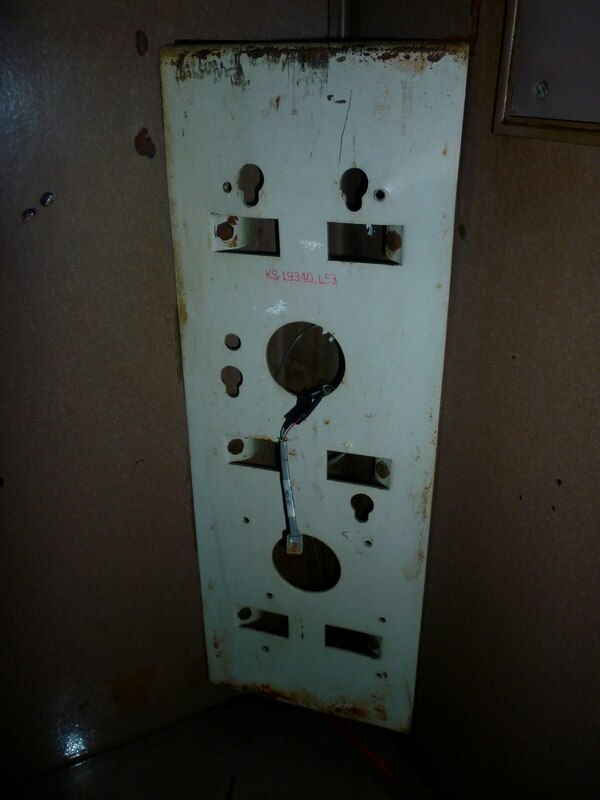 When the DOB swooped in on 149 Kane Street last year, they sealed up every window and door and opening with cinder blocks—after emptying the house of garbage and such, that is. The owner, who continued to live in the heap well after the place wasn't livable, was finally forced to vacate. It seemed that that was the end of the story for the neglected, century-old edifice. But it seems some soul out there wants to save the thing, rather than tear it down. Is it possible? We shall see. Black Gold, the oddball hybrid store sandwiched between Prime Meats and Frankies on Court Street, opened this past weekend. Need coffee and cake? Need old LPs? Need horrendously overpriced antiques and taxidermy? They've got it all. The coffee is Rook's. Comes from New Jersey. The maker is an old friend of Black Gold's owner. Looks like a nice addition to the nabe. But the prices on those musty old stoop sale pictures have to come down a little the $100 mark. Seriously. Fultummys, on a recent, fine, sunny day when sandwiches could have been sold and money made. Gino, among other things, was the home of one of Manhattan's last operating wooden phone booths. No more. When I was there on closing night, the phone was already ripped out. The bartender said a man had bought it and was going to take it away after the restaurant closed. Where? He didn't know. For my full account of the last night at Gino, please read here. The second incarnation of Skyline Books—oddly housed inside a florist shop on W. 28th Street—now has a sign of its own. And it's not called Book Gallery, as owner Rob Warren told me. 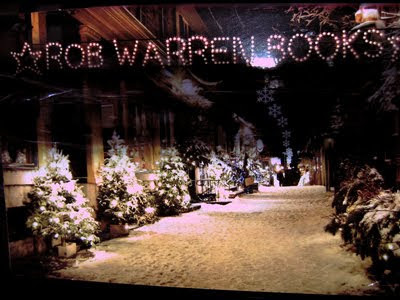 It's called, simply, Rob Warren Books. A sharp-eyed reader took the above shot and sent it in. Makes me feel all Christmasy. Skyline was forced to give up its Flatiron District shop last winter, after 20 years in the business.